At my private optometry practice, located inside the Ceres Walmart, lots of patients worry about their vision getting worse. Maybe they have a family member that has lost vision and they wonder if they will have the same fate. When it comes to prescribing glasses for healthy eyes, there is no reason to worry about your prescription getting so high that you cross some imaginary line and then you will have to use magnifying glasses or have your phone app read your bills for you. But when it comes to unhealthy eyes, that is a different story. The most common eye health issues that I see are eye allergies and dry eye disease. These conditions are usually easy to manage with over the counter eye drops, but most of my patients are not really so bothered by their eye comfort that they want to hassle with the inconvenience of using eye drops. And in my patient population, it is rare that eye allergy or dry eye disease will progress to such an advanced state that it causes serious damage to the eye health. The most common eye health issue that I see that does lead to more serious damage to the eye health is diabetic retinopathy. Diabetic retinopathy occurs when there is leaking of blood or lipids in the retina which can lead to devastating vision loss. 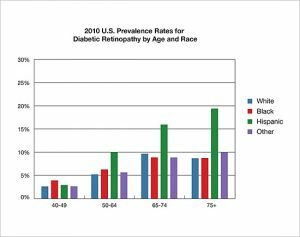 It is not just my patient population; the leading cause of blindness in the US for working-aged adults is diabetic retinopathy. In 2010, 8% of Hispanic Americans age 50 and over had diabetic retinopathy. Controlling diabetes with diet, exercise and medications can prevent or delay vision loss. But screening for eye disease is an important part of the health care program for patients with diabetes. Patients with diabetes may have diabetic retinopathy and not know about it. For this reason, it is recommended that patients receive a yearly dilated retinal exam. This type of exam will usually be covered by your medical insurance. Some patients have medical insurance plans that will take retinal photos to screen for diabetic retinopathy. This is a more cost-effective approach which has been found to be sensitive at detecting diabetic retinopathy, but not as effective at detecting other eye diseases as compared to a comprehensive eye exam. If mild stage diabetic retinopathy is detected, we typically educate the patient and their primary care physician and monitor the retina for changes every 6 to 12 months. If moderate or severe stage retinopathy is detected, or any vision loss is detected, we typically set patients up with a retinal specialist to monitor or treat. The retina specialist is an eye surgeon (ophthalmologist) who can reverse or prevent vision loss from diabetes with laser treatments, eye injections or a combination of both. If advanced stage diabetic retinopathy is detected, we will still typically refer patients in to see a retinal specialist. In these cases, we don’t expect as good of an outcome as we do in cases that are detected early. This is why it is so important for patients with diabetes to check their eye health yearly.